Even when the utmost care is taken to look after your upholstery, you would be amazed to know what actually rubs off onto the fabric with everyday use. Sweat, Grime, Food and Drink spills, Human skin flakes, Human and Pet Hair, Body oils and Dust are just to name a few. Some of these things (if left long enough) can turn into fungus and cause bacteria to grow. With Adam’s Upholstery Cleaning you will receive a premium upholstery cleaning service that can remove all of these nasties along with leaving your lounge and upholstery looking and smelling beautiful. After your Upholstery cleaning has been completed, you can ask our technician to show you the grey water that is in the truck mount tank. This dirty water is usually emptied onto your lawns or a safe area. 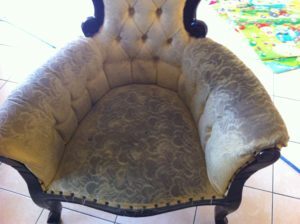 You will actually smell the concoction of dust, dirt and grime which has been extracted from your upholstery. You will also see near black water being emptied from the tank >>> and this is just from reasonably well maintained lounge suite! It’s hard to imagine you and your family were living in all of that grime. Steam cleaning your furnishings will add years to its life and most certainly freshen up the room’s decor and look. It is recommended that you steam clean your upholstery every 6 to 12 months to maintain its look, but also for health reasons. Some families prefer their cleaning to be done every 3 months, as they have young children who constantly spill food and drink. We provide expert carpet and upholstery cleaning services that restore the beauty of your furniture and upholstery while also extending their life. Our upholstery specialists use only the best cleaning solutions and products to ensure the utmost care of your upholstery. You can extend your furniture’s life by periodically turning over the loose cushions. This allows for an even distribution of wear and tear and your cushions won’t develop indentations right away. Fluffing the cushions after you’ve cleaned also helps keep them in shape. Change the cushions around from one part to the other in addition to turning them over. Some seats get more usage than others, so changing cushions around will ensure even usage. Vacuum weekly to remove surface soil. This also prevents dirt from becoming embedded into the fibres. You can also use a brush to gently whisk the dirt away. Make sure to always use a soft bristled brush. Blot any spills immediately with a clean folded towel: never rub, but blot gently. Sometimes this is enough to get rid of the stain completely, especially if the fabric has been pre-treated with a fabric protector. (Always test in an inconspicuous area before you use any product for spot cleaning). Too much sun can damage your fabric, causing it to fade and even fray. Try to position it so that it doesn’t sit in the sun for extended periods of time. This is especially true of silks. Airborne pollutants such as fumes from cooking or smoke can also harm your fabric. It isn’t always easy to avoid that from happening, however, proper ventilation can help. It can also help with odour control. 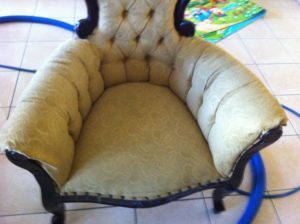 It is best to have a professional do the upholstery cleaning for you. Experts recommend having this done on a regular basis and not wait for the upholstery to get visibly dirty. The dirtier it becomes, the harder it is to restore to its original glory.